00:05 Fixer wooden keg time? 00:15 Fixer Hijiri, what problems? 00:22 RealBadAngel Hijiri, have you uptaded your UI during last few days? 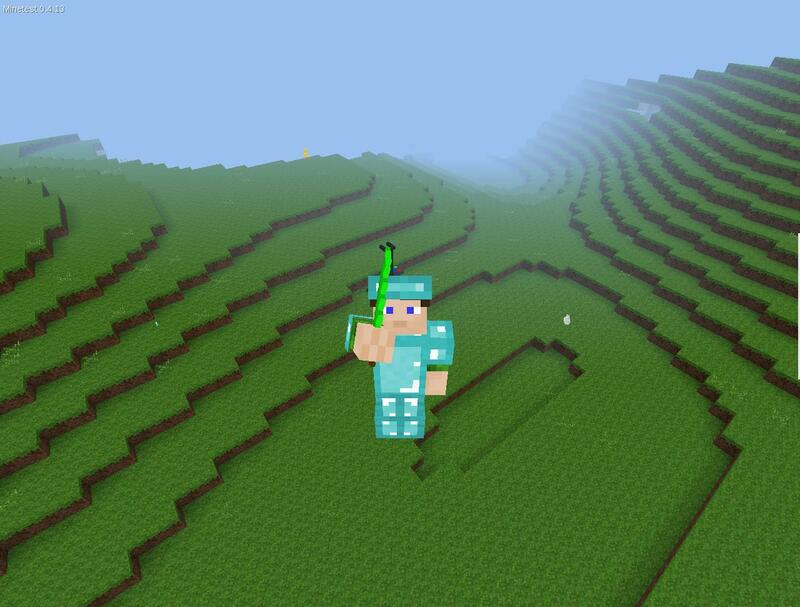 00:29 RealBadAngel Hijiri, what about updating minetest_game ? 01:17 Fritigern Is it possible to set a multi-line MOTD? 01:20 RealBadAngel have u tried to use single string with newlines in it? 01:30 jordan4ibanez Can I make particles random segments of a texture? 01:39 jordan4ibanez So if I make a gamemode, as long as I keep all the licensing information it's all legal? 01:54 sofar jordan4ibanez: you mean "subgame" ? 01:54 sofar jordan4ibanez: by combining mods? 01:58 Hijiri updating to HEAD of master? 02:02 Taoki paramat: Yeah, but that "everything else" doesn't include tree schematics or other decorations, right? 02:07 jordan4ibanez What's that mod that shows your item in your player's hand? 02:07 jordan4ibanez Also the armor mod that doesn't conflict with unified inventory? 02:11 paramat Taoki dust is after everything, including decorations, how could snow be dropped onto a world otherwise? 02:13 kaadmy jordan4ibanez: what's the player doing that high? 02:14 kaadmy is he suffocating yet? 02:22 Taoki paramat: Ah. So if there's a tree schematic spawned as a biome decoration, snow won't spawn under trees? 02:29 Taoki Ah... so it can even spawn on TOP of trees? 02:32 Taoki Ok. Will need to think about this. Thanks for clearing me up on that. 02:37 paramat you need more biome layers? 02:38 Hijiri does colorize work in formspec images? 02:38 kaeza Hijiri, it should. try? 02:41 Hijiri kaeza: does it work in image buttons also? 02:56 kaeza Hijiri, can you try using `formspec_escape` on the texture? 03:05 DI3HARD139 after 2nd to most recent driver update minetest has been crashing along side of the gfx driver. 03:05 RealBadAngel do you have any logs? 03:06 DI3HARD139 I dont think I do. lemme check. 03:06 RealBadAngel it crashes without writing anything to debug.txt? 03:07 Hijiri good or bad idea? 03:16 RealBadAngel DI3HARD139, can you run game in gdb ? 03:16 RealBadAngel are you on win or lin? 03:31 RealBadAngel DI3HARD139, it this end of log after crash? 04:20 ssieb I'm using v6 mapgen and biomes. Does anyone know where to find clay? Last I played quite a while back, it used to be found at water level in some places, but we haven't been able to find any clay at all anywhere. 04:20 ssieb I just tried searching through the database and couldn't find any there either. 10:41 gamemanj DI3HARD139: Which OS are you coming from? 11:53 gamemanj So it really depends if you consider an operating system as a "place" for the sake of metaphor. 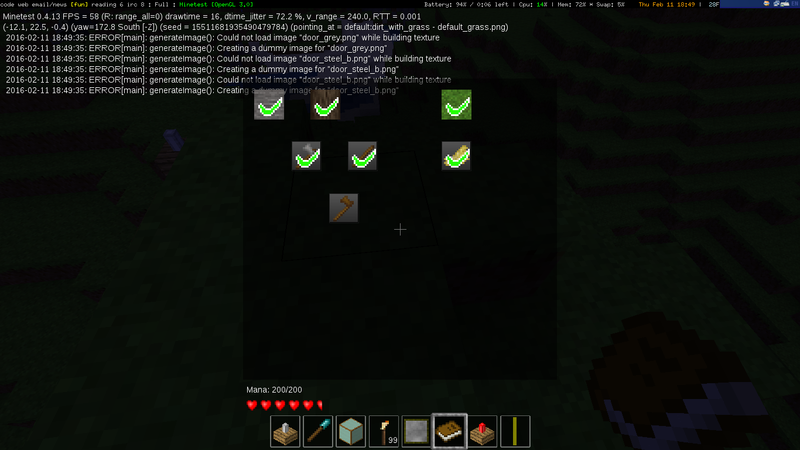 15:34 Open_Future Hi All, i have the animals modpack running, but only see creepers and ghosts etc. How do you get sheep and other regular animals to spawn? 15:44 Open_Future I must add that I added it to a world AFTER the world had already been generated....and played for a few days. 15:50 Megaf Hi all, any other insane person here using TWM? 16:00 Megaf and the heck of ping is that now? 16:00 giho Name change -> new stats? 16:00 giho xorg window manager? 16:05 kaeza as xyz once said, "a window manager for fridges"
16:06 Megaf if there's a memory leak it will be killed by the OS anyway, so why should I dedicate more for minetestserver? 16:06 Out`Of`Control more players more ram? 16:08 Out`Of`Control bot runs on same box as that server? 16:11 kaeza Megaf, what CPU, BTW? 16:16 giho Worked for me. 16:17 giho Well, irrelevant. They'll migrate you at some point anyways. 16:18 Megaf kaeza, where do you run your server now? 16:19 Megaf at least is very fast, isnt it? 19:58 steven2 when I join an online server and the client downloads lots of things (media, etc. ), where do they go?, are they deleted after I stop MT? 19:59 sofar they're cached only. 20:00 gamemanj Then what's the point of "~/.minetest/cache"? 20:00 sofar no? then why does it re-download everything every time you connect? 20:01 Obani sofar, didn't you notice it was faster after the first time ? 20:04 steven2 okay, I see media cached files, but I was looking for cached mods. But they are server side... they are not passed to clients in any way right? 20:04 gamemanj Lua code is all server-side. 20:05 gamemanj "/mods" should give you the list of mod IDs. 20:05 gamemanj Some of those will be part of the subgame, though. 20:07 steven2 ah yes, okay... thanks :) okay... I ask again just in case there are other/more people today than the other day: is there any way to intercept/log the in-game console output of the client? 20:13 ShadowNinja The server prints CHAT: lines, but the client doesn't. And that doesn't print messages sent by the server. 20:16 steven2 except maybe with --verbose, etc. 20:48 steven2 done :) (I hope; it shows now 2 areas with the same name, different IDs and different owners). Later I will test it. 20:49 Fritigern Wasn't there some setting in minetest.conf which allowed one to disable fire? 20:53 Fritigern I have disable_fire = true in my minetest.conf, but people can still take it from CI and place it. So I guess that was not the setting in question. 21:13 gamemanj Actually, no, I can do it in a one-liner if I use a few tricks, that you certainly wouldn't want to perform twice. 21:17 gamemanj iqualfragile: You might also want a depends.txt in there, though. 21:23 Fritigern Alright, about the nofire mod (i'm calling it that), does it really only need that one line? Nothing before or after that? 21:29 Fritigern The mod loads, there are no errors, but it has no effect. 21:29 gamemanj I do know that this works though. 21:30 Fritigern that is for the alias, or should I put that elsehwere? 21:31 gamemanj Basically, replace the alias line with that second line I wrote. 21:31 gamemanj so nobody has access to it. 21:36 gamemanj I think you may have been in error about that. 21:37 gamemanj Fritigern: Not sure if you'll see this, but anyway: depends.txt is needed after all, it seems. 21:37 gamemanj depends.txt should contain a single line, without the quotes: "fire"
23:12 Fixer how i supose to test it?